The age-old sport of political leaders bashing central banks has come out of the shadows of late. President Trump has taken the Fed to the woodshed, working it over with tweets. President Erdogan has morphed into Turkey’s most noteworthy monetary crank. Most recently, Prime Minister Modi and his henchmen have gone toe-to-toe with the Reserve Bank of India (RBI). Modi, backed by the Confederation of Industry and the Federation of Chambers of Commerce and Industry, has threatened to invoke Article Seven of the Reserve Bank of India Act. This “nuclear option” would allow the government to directly call the shots at the RBI. Modi and the powerful business lobbies behind him argue that the RBI is pulling on India’s monetary reigns too tightly. To date, RBI Governor Patel has stood his ground, but this spat has unnerved the markets. This, of course, isn’t the first time Modi has locked horns with a governor at the RBI. The last time was in 2016, when the government failed to extend Governor Rajan’s contract. And, let’s not forget the great demonetization fiasco of 2016, a policy that Modi forced down the RBI’s throat. So, does Modi have a case? To answer that question, let’s take a look at the RBI’s policies and performance. The best way to do that is through a monetarist lens, one that has been finely ground by my friend and mentor, the late great Milton Friedman. As Friedman put it in his 1987 New Palgrave Dictionary of Economics entry, “Quantity Theory of Money” (QTM), “The conclusion (of the QTM) is that substantial changes in prices or nominal income are almost always the result of changes in the nominal supply of money.” The income form of the QTM states: MV=Py, where M is the money supply, V is the Velocity of money, P is the price level, and y is real GDP (national income). Let’s use the QTM to make some bench calculations to determine what the “golden growth” rates are for the money supply. These are the rates of broad money growth that would allow the RBI to hit its inflation target. I calculate the “golden growth” rates for two separate periods. According to my calculations, the average percent real GDP growth from 2004-2014 was 7.62%, the average growth in Total Money Supply (M3) was 16.99%, and the average change in the velocity of money was -1.91%. Using these values and the RBI’s inflation target of 4%, I calculated India’s “golden growth” rate for Total Money to be 13.53%. According to my calculations, the average percent real GDP growth from 2014 to 2018 has been 7.38%, the average growth in Total Money Supply (M3) has been 8.92%, and the average change in the velocity of money has been 1.44%. Using these values and the RBI’s inflation target of 4%, I calculated India’s “golden growth” rate for Total Money to be 9.94%. 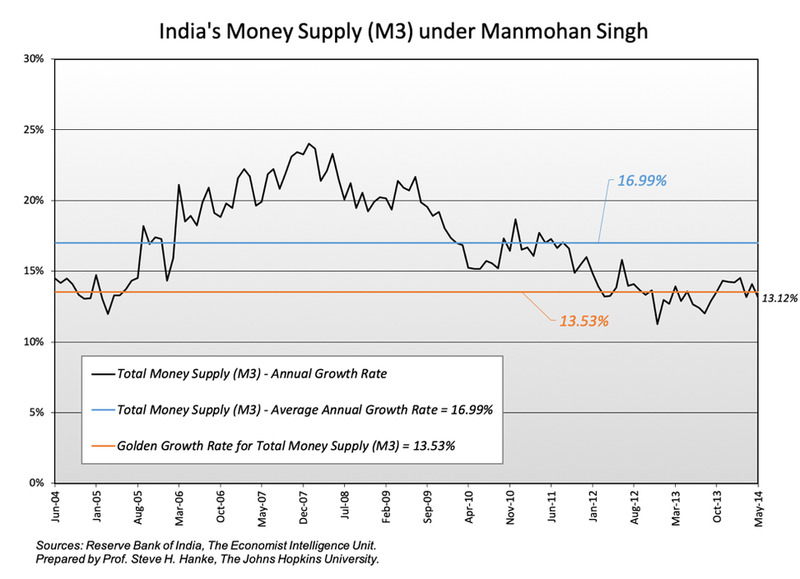 So, during the Singh years (2004-2014), the RBI’s monetary policy was a looser than “optimal,” with the rate of growth in broad money exceeding the golden growth rate by a significant margin, 3.46 percentage points. Not surprisingly, India’s realized inflation exceeded the RBI’s inflation target of 4% per year, too (see the chart below). Enter Modi on May 26, 2014. 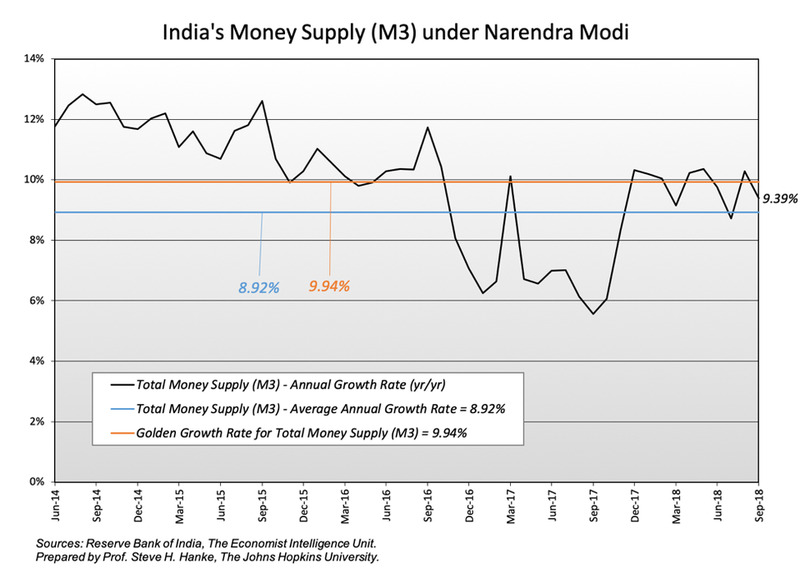 Since then, the RBI, in an attempt to bring inflation down to its 4% target, has slowed the growth rate of broad money. Indeed, M2 has grown at 1.02 percentage points less than the growth rate. 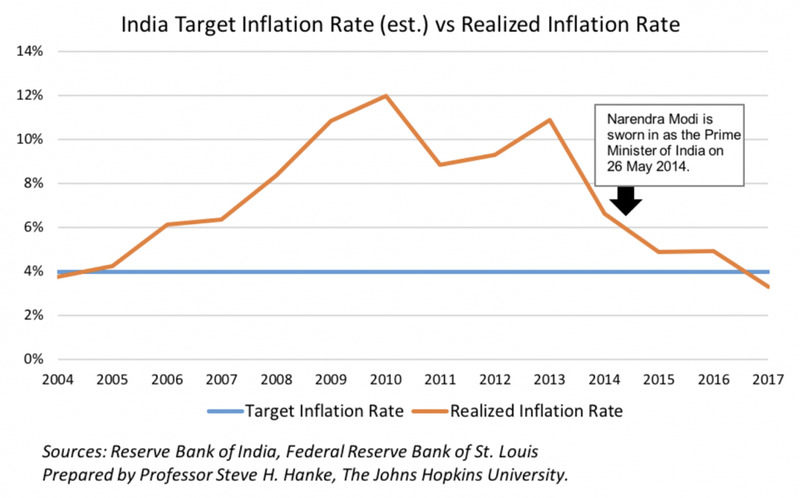 This tightening has brought India’s inflation down to just under its target rate. With this record, the RBI and Governor Patel should stand their ground and swat away criticisms from P.M. Modi and India’s business lobbies.